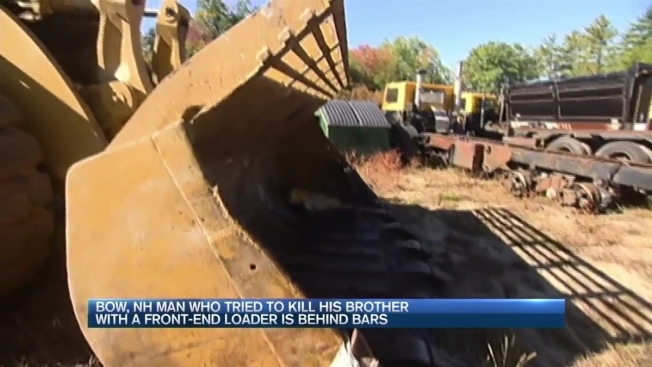 New Hampshire arrested a man responsible for attacking his brother with a front-end loader at Zero Waste, a recycling business, before driving it toward officers and crashing into a building. Fifty-four-year-old Peter Emanuel is accused of using the equipment Wednesday in Bow to topple his brother Stanley Emanuel who was operating a giant blue excavator. Bow Police say they found Peter Emanuel inside this piece of heavy equipment - ignoring their commands - when they responded to a 911 call from Zero Waste. Stanley, while scared for his life yesterday, is forgiving today - convinced the violence is a result of his brother’s struggle with mental health. "Hopefully my brother Peter will get the help he needs. We love him and hope the best for him," he said. Peter Emanuel faces three felonies - attempted first-degree assault, criminal mischief and resisting detention. He is being held on a 170 thousand dollars cash-only bail.